Be the first to share your favorite memory, photo or story of Marilynn. This memorial page is dedicated for family, friends and future generations to celebrate the life of their loved one. 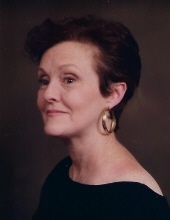 SPOHN, Marilynn Ann (Walsh) - age 76, of Swartz Creek passed away April 11, 2019 from complications after a courageous recovery from cancer. A Memorial Mass will be celebrated 11 AM Wednesday, April 24, 2019 at St. Mary Queen of Angels Catholic Church, 4413 Morrish Rd., Swartz Creek with Fr. Louis Ekka celebrant. The family will receive friends from 9 AM - 11 AM Wednesday at the church. In lieu of flowers, contributions may be made to the Genesee Cancer and Blood Treatment Center, 302 Kensington Ave, Flint. Marilynn was born September 27, 1942 in Flint, the daughter of Mallen and Evelyn (O'Brien) Walsh. Surviving are: husband of 44 years, Charles Spohn; four daughters, Kimberly Cannon, Celeste (David) Shephard, Larraine (Glenn) Edwards, Julie (Sal) Gonzales; 13 grandchildren, 10 great-grandchildren; sister, Martha Bories. She was preceded in death by: son, Mallen Scott Miller; parents, Evelyn and Mallen Walsh; sister, Marlene Huyady; and step-daughter, Teresa Spohn. Arrangements by: Sharp Funeral Homes, Miller Road Chapel. Tributes may be shared at www.sharpfuneralhomes.com. To send flowers or a remembrance gift to the family of Marilynn Ann Spohn, please visit our Tribute Store. Guaranteed delivery before Marilynn's visitation begins. Guaranteed delivery before Marilynn's funeral mass begins. "Email Address" would like to share the life celebration of Marilynn Ann Spohn. Click on the "link" to go to share a favorite memory or leave a condolence message for the family.